So you may be wondering what I've been doing these past couple weeks...even if you're not wondering I'm gonna tell you anyway. Making baby quilts! Yes, the girl who has been telling you that she's not a seamstress has made three baby quilts over the last two weeks! And I will still say I'm not a seamstress since I can't make anything else, but I am a baby quilt maker! 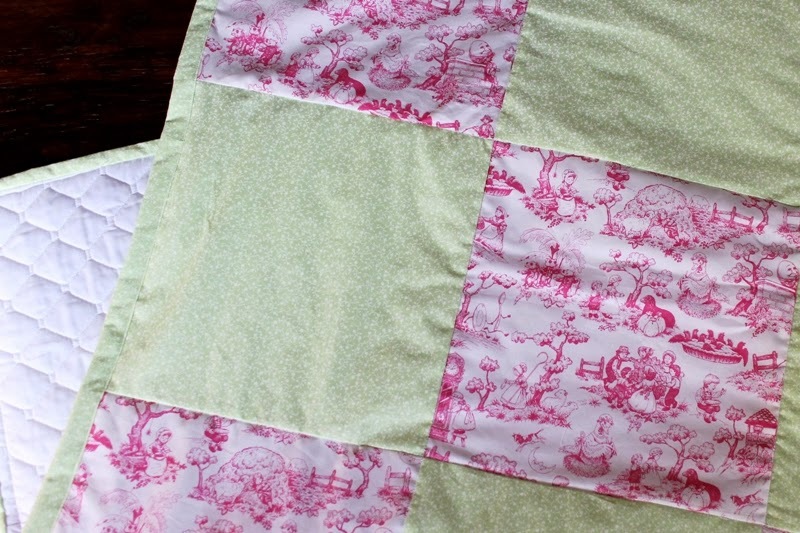 Two of the quilts are going to be gifts so I can't show them to you just yet, but I found this pink toile with scenes from nursery rhymes on it and just had to get it because I love toile! Plus those two quilts that I can't show you are both for baby boys so I was itching to do something girly. I also found a pretty green print with ivy made from hearts and knew it would complement the pink toile perfectly. A white quilted fabric for the backing would complete the look. You may have noticed that I've learned how to do binding since the last quilt I shared with you! YouTube sure is handy! I think binding gives the quilt a finished look. I discovered something that I never knew about myself, that I LOVE sewing, well, maybe not sewing in general, but I love making baby quilts! I love the process of it as much as I love seeing the finished product. I love picking out the fabric, laying it out and seeing that I can make something useful and cute! I've decided to add them to my Etsy shop. Now, I promise my blog will not become advertising for my Etsy shop, but I thought I'd share that I'm adding a new category that I'm so excited about it! Also, if I may ask those of you who have Etsy shops, do you have any tips to share that you've learned along the way? I've not sold anything yet and I know I just started but any advice would be appreciated so much! So pretty. I love the toile. It is a lovely quilt; I've never tried making one. I love toile fabric and the pink looks gorgeous with the green. Beautiful! I too love toile-I have a love seat in a brown toile that I adore. I just knew you had a talent for this sewing business, beautiful and such a lovely combination of colors! Your so funny and sweet Khammany!!!! Love toile in any way, shape or form, and your right to add this to your Etsy shop dear,you have to share your talent more right?! Love it! 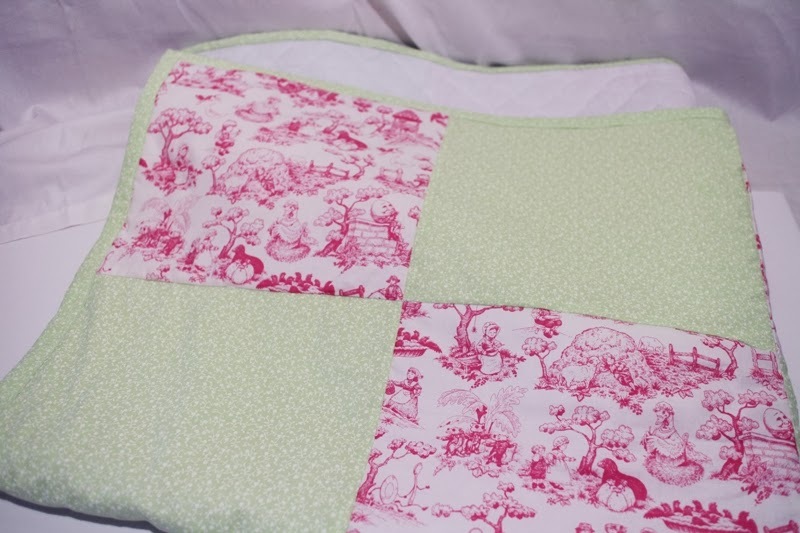 Love your enthusiasm for sewing, your baby quilt is lovely. I've always said anyone can sew. The quilts are gorgeous and I love that Toile with the nursery rhymes. It is wonderful to read that you love sewing! I find it so relaxing and there would not be a day that I don't do some, even if it is 10 minutes before bed. Wow Khammany, that's impressive for a first timer. I would love to sew if I know how. But that is in my bucket list to do next year. I think I will start with quilting. I love toile too, and the nursery rhymes are just gorgeous. How I wish I had a grand-daughter coming, and I would buy one of your lovely quilts in a heartbeat! Very pretty! I still have my children's hand made baby quilts from when they were babies. There were not made by me, I cannot sew at all! Great job! These are precious! I know they will be treasured items...I still have my children's baby quilts! This will be such a cute baby quilt. Please show us when it's done. So beautiful and precious.Well done!!! Sewing must be a very creative and regenerating activity! Well you had me at toile. Plus the pink and soft green are perfect together. I kinda wish there was a baby girl to be born around me! Now about the Etsy, I wish I had word of wisdom to pass on to you, but I'm just a beginner as well. The only thing I'd say is to treat your customer like friends, because it makes the job so much more interesting. This is truly beautiful! My great-great grandmother, great grandmother and my grandmother all quilted and I have their treasures to this day…I will not part with them! These quilts will be excellent gifts for anyone and everyone and you are incredibly talented! Love that quilt. Ah, babies. I can see why you love making quilts for them. You are making me re-think sewing...making me want to give it a try again. Kudos to you, Khammany! Your baby quilts are adorable! You are very talented and tackle new projects in an artsy way. Wow, how talented you are. This quilt is beautiful. Love the pink toile. I like the pink toile a lot and I think it will give a new baby a great sensory scene! Keep up the good work, friend!! I made a dress for my daughter, and I love making it so much I turned it into a business too! Over the four years, I did end up having a few people working for me, sold my dresses online, on Etsy, and in stores. I sold my fabric and notions when we moved to England, but that was a great time in my life (well, now is too). It is so wonderful to find something you are passionate about. You go girl! Quilting is way beyond my skill level. I absolutely love toile (anything). I once had 20' drapes in my previous home made of red silk toile with the print in black and they were stunning. Your quilt is going to look.amazing. That print is so perfect! I love the dish and spoon.